Is Discharging Taxes In Bankruptcy Possible? Yes, it is possible to discharge taxes in bankruptcy. But, you have to have an in depth understanding of both the internal revenue code and the bankruptcy code rules and regulations. Generally speaking you can discharge income taxes in bankruptcy if the bankruptcy petition filing date is over three years after the due date of the income tax return including extensions. That the bankruptcy petition is filed two years after the actual filing date. And, that the bankruptcy petition filing date has to be over 240 days after the assessment date. Those rules can be tolled, which means that they are not running for a myriad of reasons such as collections due process appeal, if you are out of the country for an extended period of time, or other appeals such as an offer in compromise or a discharge in bankruptcy petition itself. So, there are all sorts of ways for the IRS to toll those statutes of limitations. Most people don't realize the different between chapter 7 and chapter 13 bankruptcy. A chapter 7 bankruptcy is a theoretical one moment in time bankruptcy. Everything is looked at based on how it existed on the date that the bankruptcy was filed. The things that go into it will take time, for instance, it will take 3 months in order to do a creditors meeting, it will take 2-3 months in order to get a final discharge, but theoretically it's a one moment in time discharge. If the taxes were dischargeable at the moment when you filed the bankruptcy petition, then they are dischargeable, if they were not, then they are not dischargeable. You just have to run the 2 year, 3 year and 240 analysis on them. A chapter 13 bankruptcy is generally a 5 year plan, sometimes it can be a 3 year plan or shorter, sometimes it can even be a 7 year plan, but generally it is a 5 year plan to pay off all of your creditors including all of the non-dischargeable tax liabilities and unsecured creditors over that period of time. Chapter 7 is a much better situation than a chapter 13, but for a lot of people chapter 7 is not an option because they are making too much money or do not comply with the means test. There is a means test that they have to go through to determine if the court will kick them out of a chapter 7 and move them into a chapter 13 which means it will be a 5 year plan. So, you don't really want to do a chapter 13 unless it's your only option because you don't pass the means test. What Are The Requirements To Discharge Taxes In Bankruptcy? The first thing that you need to do is conduct the analysis to determine whether the taxes are dischargeable in bankruptcy and when. Once you do the analysis for each and every tax year, what you will find is that certain taxes will be dischargeable now and certain taxes will be dischargeable if you wait a little while.so you have to do the analysis to figure out what taxes you owe before you can determine if you can discharge those taxes in bankruptcy. That is the first step. Then, the rest of the bankruptcy is fairly easy, you just file the bankruptcy petition, go to the creditors meeting and the taxes are discharged. What Does Not Qualify For The Discharge Of Taxes In Bankruptcy? The trust fund recovery penalty is not dischargeable in bankruptcy, excise taxes and the civil fraud penalty may not be dischargeable in bankruptcy if the IRS deems it to not be in the interest of the IRS for that person to be let out of the civil fraud penalty. This firm does not file bankruptcy for clients. 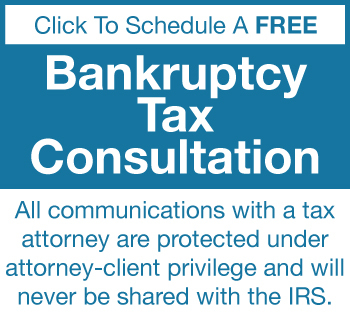 We do have other firms that we work with and can highly recommend for filing bankruptcy, however when the IRS knows that a tax attorney also does bankruptcy, the IRS will immediately file liens and levies against the clients of that attorney because they know that those clients are going to end up filing bankruptcy. That is why we do not file bankruptcy for our clients. This policy keeps our client record clean and is a contributing factor to why local IRS agents do not file liens and levies against our clients as fast as they will against the clients of other tax attorneys. It is because we prepare our cases to go the distance and attain the absolute best possible resolution of tax liabilities on behalf of our clients.